I've taken some time away from the blog, and revisiting has shown me that this is the most trafficked post on my site. So as of 5/11/16 I have updated the post with tips for maximizing your yield, which you'll find at the bottom. I get this a lot after people pick up their meat from the plant: “I only got X pounds of meat and half of it was ground beef!” and I have to remind them, gently, that they asked for completely trimmed boneless steaks and 90/10 lean ground beef... They think they got robbed, as if we make our real money skimming steaks off each order and selling them on the t-bone black market. We’re only in business to cut your meat exactly how you ask for it. If most butchers were really stealing your meat, they'd go out of business pretty quickly. Plus, many butchers, especially in rural areas, already grow their own meat; they don't need yours. Processors will tell you that there is no exact formula to determine take home yield. Feed, muscle structure, cut requests, and many other small details affect the final weight of the products. For instance, a cow can come in who is enormous, but if they have poor marbling, then a lot of that weight may be held as fat around the body. If the customer asks for 1/4 inch fat trim, you can bet that some of that weight is falling into the waste barrel when we trim the steaks. Likewise if the cow is not very muscular, or the customer requests many boneless items. So how do we tell our customers how much meat they can expect to take home? With the disclaimer that anything and everything can affect final yield, you can use a general formula for determining what you can reasonably expect with a common set of cuts and an average live animal weight. The animal can be weighed three times throughout processing. When it first arrives, it is ushered onto a large scale and the weight is read from a digital readout and documented on the receiving form. This is called the “live weight”. Taking the live weight is not required, but it is a nice bonus for our customers. The producer is able to take the yield data and find patterns in their livestock which may help them with feed choices, breeding selection, and ultimately herd improvement. The animal then is brought onto the kill floor - I’m sorry, I mean, “harvesting room” - and slaughtered. At this point we remove their skin, intestines, organs, hoofs, blood and head. 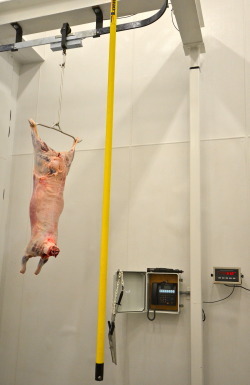 We weigh them after slaughter and this is called the “carcass weight”, “dressed weight”, or sometimes “hanging weight”. Examples of factors at this stage that can affect yield, beyond the removal of the items above, are gut fill (last meal) and even whether or not the animal is muddy, such as on unshorn sheep. The carcass then spends an evening or two in the holding cooler. When it leaves the cooler and heads into the processing room, we break the carcass down into the final cuts and package them. This is where the most variation in yield happens. Boneless vs. bone-in, leanness of ground beef, grinding certain roasts, all of these cutting instructions will dictate how much of the carcass makes it into your freezer and how much ends up going into the waste barrel. The final cuts can be weighed and tallied to produce a “take home”, or “packaged weight”. Please note that not all processors tally weights. To calculate what the carcass weight would likely be, take the live weight, and multiply by the percentage in the first column. Then take this number and multiply by the percentage in the final column to estimate your take home yield. The pork and beef figures were taken from the Iowa State University Extension office’s “Whole Animal Buying Guide”. The lamb yields were taken from South Dakota State University Department of Animal and Range Sciences’ “Did the Locker Steal Some of my Meat?” by Duane M. Wulf, PhD. As you can see, the take home weight is less than half of the original weight of the animal. Ground beef could easily make up around 50% of that weight. Read the next post in this series on how much ground beef you can expect. Keep a yield table on hand, right along with your price lists, cut sheets, etc. If this is their first rodeo buying and/or processing an animal, you could share a copy of this sheet when you are taking down their cut requests. Give them an overview of what they can expect but be sure to let them know that anything can happen. Better to educate all of your customers about it beforehand than to receive a “butcher stole my meat” phone call later. If you are purchasing the animal from a farmer, ask if they have any yield data. If it's a heritage breed, you can research that breed's muscle structure to make sure there is good fat distribution. There is an optimal age to slaughter too - when it comes to livestock, bigger isn't always better. Once a steer or cow gets past a certain age, most of what they eat might not go into marbling but could just be tacked on as outer body fat. Unless you're keeping all the fat, you may be paying extra for fat you're throwing away. If you are the farmer and processing for yourself, ask your processor for as much yield data as they can give you. Start to collect this data and when you have enough, analyze it. You may be able to identify areas where you can improve the yield in your herd. As a customer, you are welcome to take everything that the USDA will allow you take according to custom exempt or USDA resale regulations. But, note that the price you pay will be on the total poundage that you take home, so just because it may have ended up as trash in the facility, doesn't mean it's free for you. This often includes everything but certain organs and potentially not the spinal column if the cow is over 30 months. Even if you prefer mostly boneless items, you can ask to save your bones in separate packages for use in making broth/stock. You can ask for fattier ground, or if you prefer leaner ground, package the fat separately. If it's a pig, ask for the kidney fat - this is the clean, creamy fat that is used to make lard. Experiment with offal - there are lots of people who enjoy things like sweetbreads, head cheese and pig's ears, and with the right cooking treatment you might too. Also, you'll want to make sure you're not cutting your steaks too thin or requiring too much packaging. When a customer comes to me and says "I want 1/4 inch steaks, packaged individually," that would take me 4 times as long (!) to cut them (because our standard is 1 inch), and eight times (!!!) as many packages (because our standard is 2 per pack). Over the course of a whole animal, my already slim profit margin will take a serious hit - labor, labels and packaging are not cheap. I always encourage processors to charge extra for anything thinner than 1/2 inch and packaging individually. You can even keep your hide, and although it's not edible, it would make a fun project if you want to try tanning. Any other tips for maximizing yield? Let me know in the comments. More questions? Feel free to contact me.